In Africa, on the borders of Zimbabwe and Zambia, sits the world’s largest waterfall, Victoria Falls. Victoria Falls was named by a Scottish missionary and explorer, Dr. David Livingstone for Queen Victoria, the queen of England at the time. It is 1 mile wide and 360 feet high. The Zambezi River is the fourth largest river in Africa, running over 1,600 miles from its source to the sea. Along the way, it passes through the countries of Zambia, Angola, Namibia, Botswana, Zimbabwe and Mozambique. Between the borders of Zimbabwe and Zambia, the river plunges more than 350 feet. Here is Victoria Falls, the largest waterfall in the world. In Africa, on the borders of Zimbabwe and Zambia, sits the world’s largest waterfall, Victoria Falls. It is 1 mile wide and 360 feet high. When you visit Victoria Falls, you’ll see a lot of mist rising from the falls. The falls are also called Mosi-oa-Tunya, which means “smoke that thunders.” Victoria Falls is protected by two national forests. Lots of wildlife lives near the falls, including elephants and hippos. During the rainy season, 300,000 gallons of water pour over the falls every second. During this season, spray from the falls shoots over 1,000 feet in the air. The surrounding rain forest experiences constant rainfall from the spray. Many people hike on the trails to see the falls. Some people take helicopter tours. Victoria Falls has a rainy season and a dry season. During the dry season in late August to October, you can walk across the top of the falls. People swim at the top of the falls. A group of rocks form a natural swimming pool known as the Devil’s Pool. Elephants, birds and other animals flock to the river and the falls during this season. During the rainy season of November through April, there is so much water and mist that it’s hard to see the falls. The river and the falls can be very dangerous during this season. June and July are good times to visit. David Livingstone named the falls in 1855 after Queen Victoria. In 1964, Zambia gained independence from Great Britain. The people renamed most of the streets and cities in their countries with African names. They kept the names of Victoria Falls and the city of Livingstone because they love Dr. Livingstone. All about Victoria Falls: During the dry season in late August to October, you can walk across the top of the falls. A video all about the Victoria Falls in Zimbabwe. Question: Can people swim in Victoria Falls? Answer: At certain times of the year, a natural pool forms at the top of the falls. This pool is known as Devil’s Pool. You can swim there, but don’t get too close to the edge. Question: When are the falls most beautiful? Answer: The falls are at their biggest during the rainy season. During this time you may see rainbows during the day and moonbows at night. The river is beautiful during the dry season too because during this time you’ll see more birds, hippos, fish and other animals. Enjoyed the Easy Earth Science for Kids Website all about Victoria Falls info? Take the FREE & fun Victoria Falls quiz and download FREE Victoria Falls worksheet for kids. For lengthy info click here. Declan, Tobin. " Victoria Falls Facts for Kids ." Easy Science for Kids, Apr 2019. Web. 25 Apr 2019. 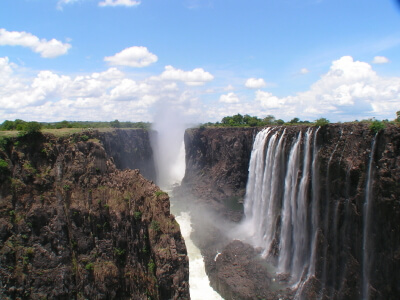 < https://easyscienceforkids.com/all-about-victoria-falls/ >.